***Now including an offset bushing that enables fitting in Saiga rifles and others that don’t quite line up with the regular bushings. The Saiga 12 requires a slight mod to the housing which will be incorporated into the design. 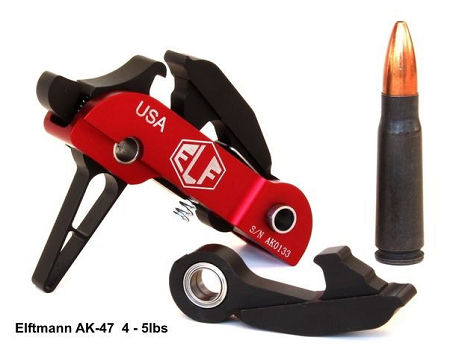 The ELF Drop-In AK-47 Trigger has been built for outstanding performance in the punishing AK-47 platform. The only AK-47 trigger using aerospace grade sealed bearings, making for an incredibly smooth and fast trigger pull. Pull weight is adjustable by swapping trigger springs or adding spacers. A second-to-none AK-47 drop-in trigger system that is strong and light, made of wire EDM machined, hardened A2 tool steel and lightweight aircraft-grade aluminum. Installation can be done in minutes using your AK’s original hammer and trigger pins. The AK trigger may be ordered with a curved or straight shoe. One look at the MASSIVE 3/8” wide hammer and disconnector and you know this is a serious upgrade for your AK Rifle. If you are looking for the finest adjustable trigger for your AK-47 or AK-74 platform, this is the trigger system for you.